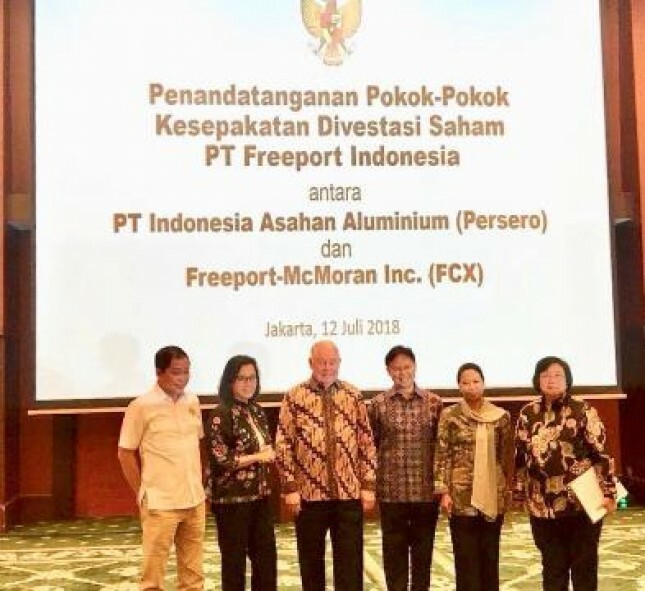 INDUSTRY.co.id - Jakarta - Mining Industry Holdings INALUM, Freeport McMoRan Inc. (FCX) and Rio Tinto, signed the Head of Agreement related to the sale of FCX shares and Rio Tinto's participation rights at PT Freeport Indonesia (PTFI) to INALUM. INALUM ownership in PTFI after the sale of shares and rights was 51.23% from 9.36%. The signing was carried out by INALUM President Director Budi G. Sadikin and FCX CEO Richard Adkerson, witnessed by Finance Minister Sri Mulyani, Minister of State-Owned Enterprises Rini Sumarno, ESDM Minister Ignasius Jonan and Environment and Forestry Minister Siti Nurbaya at the Ministry of Finance, Central Jakarta on Thursday (7/12/2018). Under the agreement, Inalum spent US $ 3.85 billion to buy FCX shares and Rio Tinto's participation rights at PTFI. The parties will complete this sale and purchase agreement before the end of 2018. The terms of this agreement are in line with the agreement on 12 January 2018 between the Government of Indonesia, the Provincial Government of Papua, and the Government of Mimika Regency, where the local government will get a share of 10% of PTFI's share ownership. Finance Minister Sri Mulyani said the Government is committed to maintaining an investment climate that provides certainty to investors investing in Indonesia in accordance with the permits granted by the Government in the form of a Special Mining Business License (IUPK). With the signing of the Principles of this Agreement, FCX and INALUM cooperation is expected to improve the quality and value added of extractive industries in the future as well as to provide prosperity for the people of Indonesia. SOE Minister Rini Soemarno said, "In line with the function of development agency, SOEs continue to drive the downstream process of the Indonesian mining industry and a high commitment to improve the welfare of all communities, especially in Papua by ensuring the share of local government in this agreement." We expect the added value of copper commodity to be further improved through the development of a copper smelter with a capacity of 2-2.6 million tons per year within 5 years. Minister of Environment and Forestry Affairs Siti Nurbaya added that through the control of PTFI's majority share by INALUM, the Government expects the quality of environmental management in the PTFI mine area to be continuously improved. We believe that PTFI as one of the largest mine managers in the world, will be able to maintain the sustainability aspects of the mine affected environment.